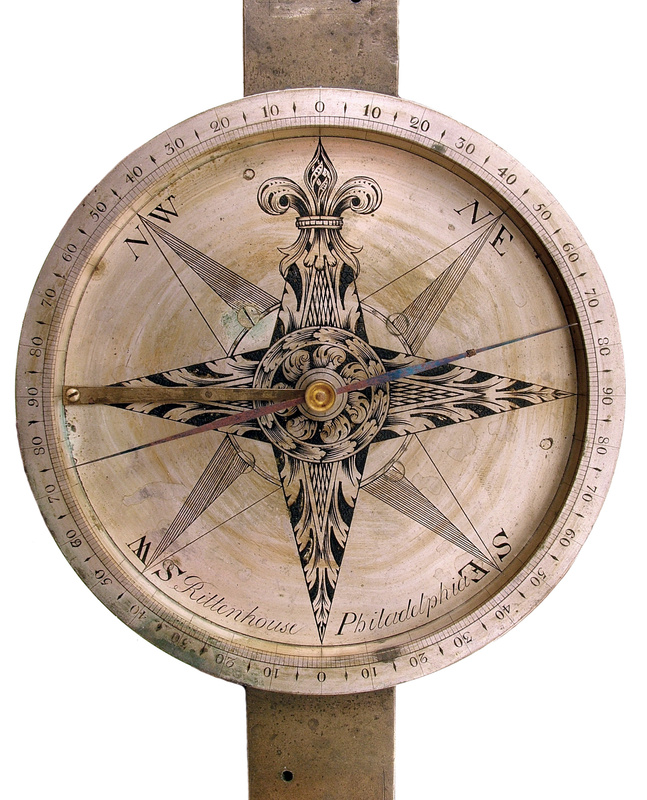 As a researcher and restorer of 18th century Colonial surveying instruments, I primarily deal with the artistically crafted surveying compass. These instruments often have beautifully executed engraving, combined with technologically advanced workmanship for their generation. They stand out from the later instruments of the mid-19th century where mechanical repetition produced functional instruments devoid of the spark of artistic creativity. While visiting a collector with whom I had corresponded, I inspected an instrument which appeared to be beautifully engraved but also, at first glance, gave the impression of having the ends of the main arms cut off in a most unceremonious manner. How could one do this to such an artistic instrument? To make matters more disconcerting, the instrument was signed, “Rittenhouse, Philadelphia” (see Figure 1). I was given the instrument to study and it became obvious by the level of engraving and craftsmanship that this was, as I had suspected, the work of David Rittenhouse, the elder (not to be confused with David Rittenhouse, Junior, who was the son of Benjamin Rittenhouse). David, the elder, was the accomplished astronomer who, in documenting the Transit of Venus in 1769, established his reputation as a world-class astronomer, mathematician, clock maker, and instrument maker. The fact that this instrument was indeed the work of the master, David Rittenhouse, made the cut-off arms even more of a travesty. 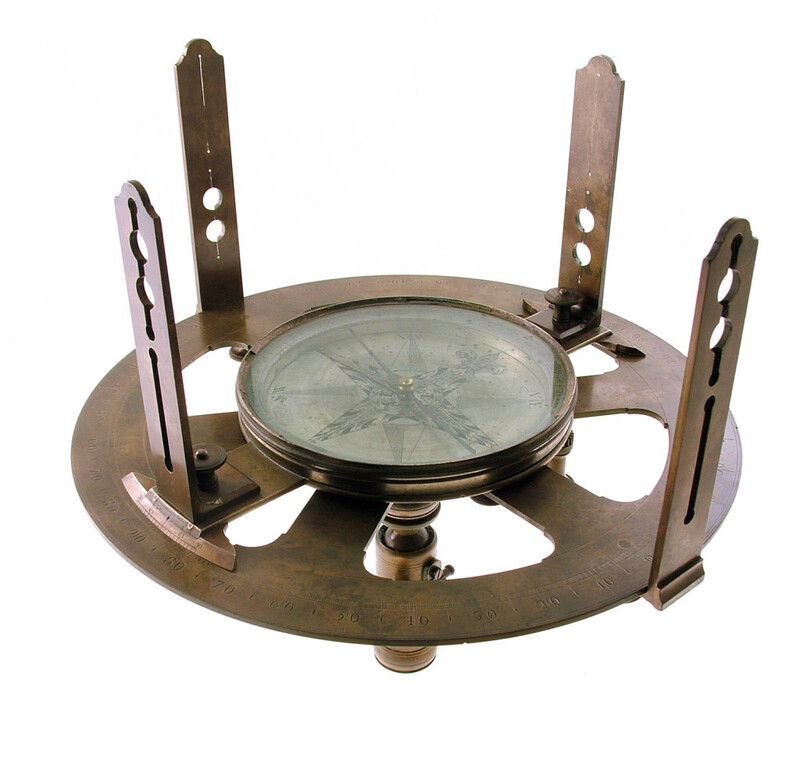 After the shock wore off and I began the initial study of this seemingly defaced masterpiece, I was able to identify characteristics that made it clear this was no ordinary surveyor’s compass. Underneath the compass box there was a large, full-circle ring gear as well as a second gear-drive assembly on the socket that would permit the entire unit to be precisely rotated up to 45°. I was quite relieved to find, after closer inspection, that the apparent cut-off ends of the main horizontal arms were in fact remnants of opposing verniers that were originally pinned to the ends of the fiducial North/South arms of the compass (see Figure 2). The remnants of these arms carried the partial engraving of the vernier scale that made it obvious this was no ordinary surveyor’s compass (although even an ordinary surveyor’s compass by David Rittenhouse, the elder, is quite rare; at this date only seven examples have been uncovered). 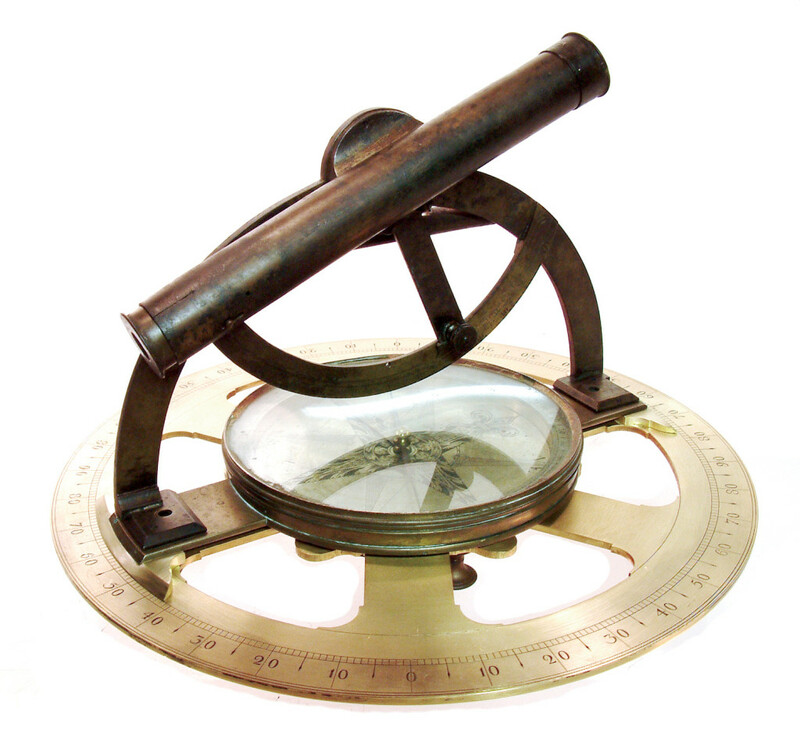 It became clear this was in fact the central compass and arms of a theodolite and is the only one known to have been built by this esteemed maker. As I sat there, astonished at the historical importance of exactly what it was that I had in my hands, the most amazing fact was yet to come. As I explained to the collectors what they had in their collection, going through all the mechanical details of its construction, one of the owners made the casual comment “ … wait, we also received a small telescope when we purchased it years ago.” Envisioning a small, hand-held telescope that might have been included as part of the transaction, I really was not expecting to be any more impressed than I already was. To my amazement the owner re-appeared with a small telescope mounted on a semi-circular vertical arc, with a scale obviously engraved by the hand of David Rittenhouse. 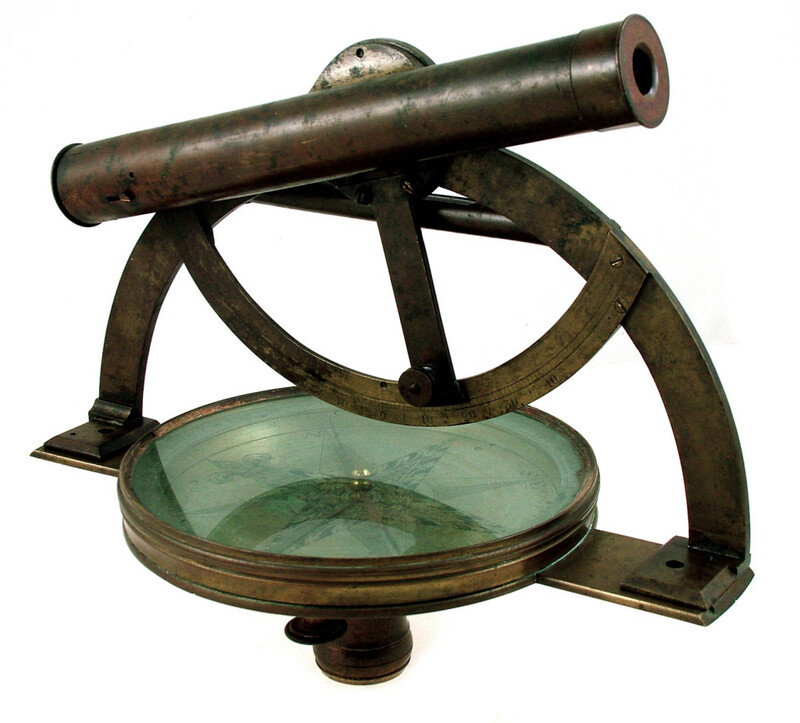 This telescope and vertical arc assembly fit precisely into pinned holes in the North/South arms of the compass (see Figure 3). 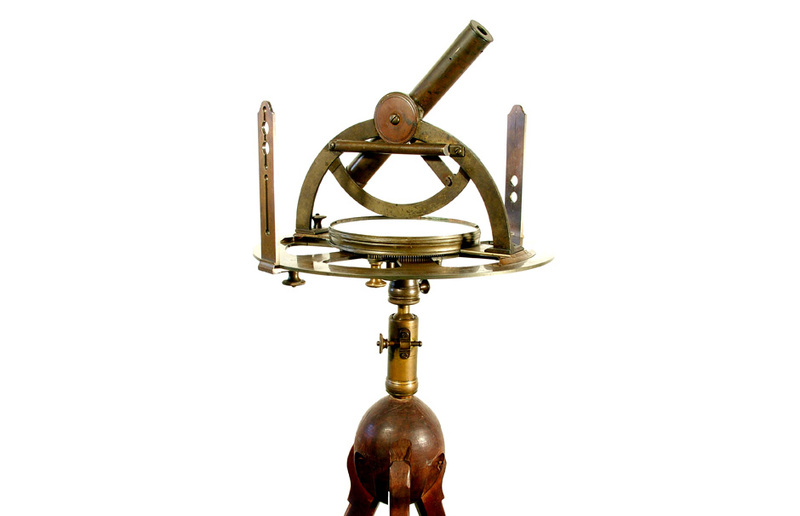 Not only did I have in my hands the only gear-driven theodolite by the esteemed maker, David Rittenhouse, but with the introduction of the telescope assembly it was now elevated to one of the most important historical finds of this field in recent memory. The owners agreed to let me take the compass and telescope for further study. I would propose a mock-up of what the finished instrument would have looked like allowing them to consider the re-construction of the missing pieces and returning the theodolite to its original configuration. By studying the only other similar Colonial instrument of which I was aware, one produced by Benjamin Chandlee (father of Goldsmith Chandlee) that is located at the American Philosophical Society in Philadelphia, it was obvious that the Chandlee instrument would be helpful for proportions and dimensions. 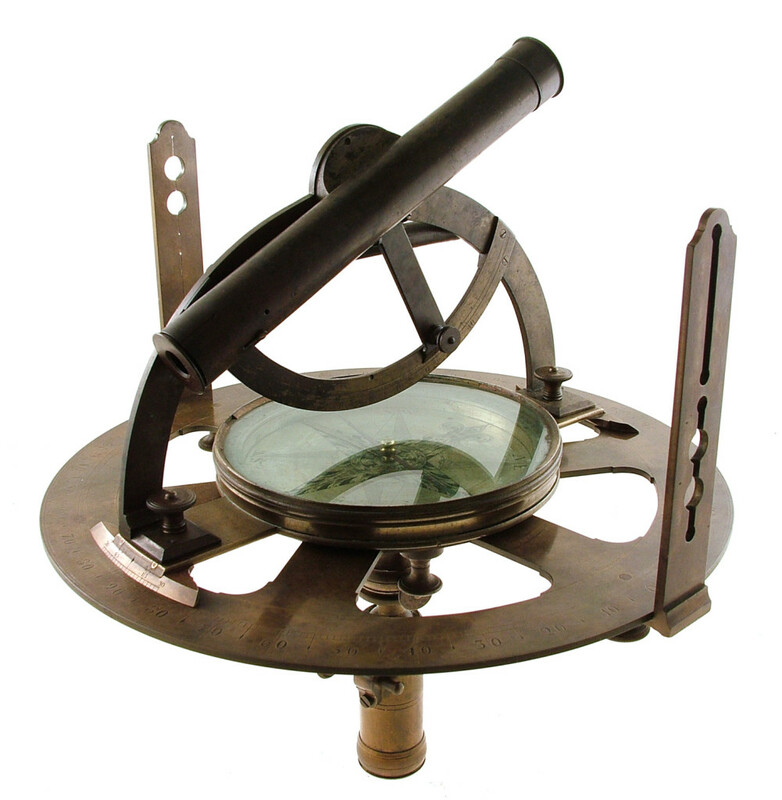 During the 18th century, English makers constructed theodolites of this configuration and an English example was perhaps studied by David Rittenhouse as an initial concept for this particular theodolite. Some of the English instruments had replaceable telescopes, as well as sight vanes for the moveable limbs. The telescope would be used to read vertical altitude angles. When only horizontal angles were to be read, the telescope would be removed and two sight vanes were put in its place on the horizontal arms (see Figure 4). The telescope was an amazing example of optical work. At a diminutive length of 9″ it had incredible clarity and a focusing range from 8 feet to infinity. The image was non-erecting and upon disassembly revealed the provision for internal, adjustable cross hairs. I began fabrication of the horizontal circle by constructing a mock-up plate out of aluminum, which was chosen over the much harder brass. Once the proportions of the aluminum horizontal plate “looked” right, e.g. 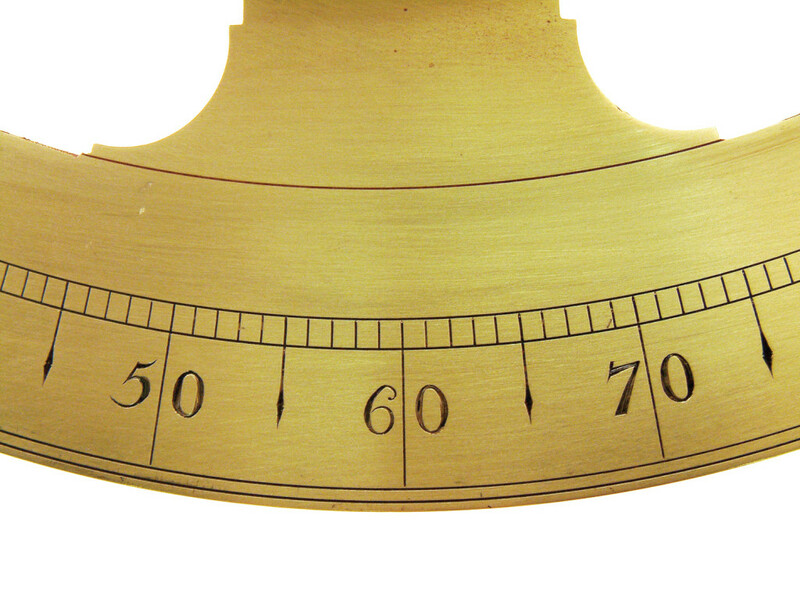 the relationship of the number of spokes, their width, as well as the width of the outer circumference allowing for the eventual dividing and engraving of numbers, I began to cut the final plate out of brass. By fabricating a depthing tool specifically for this project, I was able to measure the correct dimensions for the distance between the new pinion gear and the original ring gear on the underside of the compass (see Figure 5). 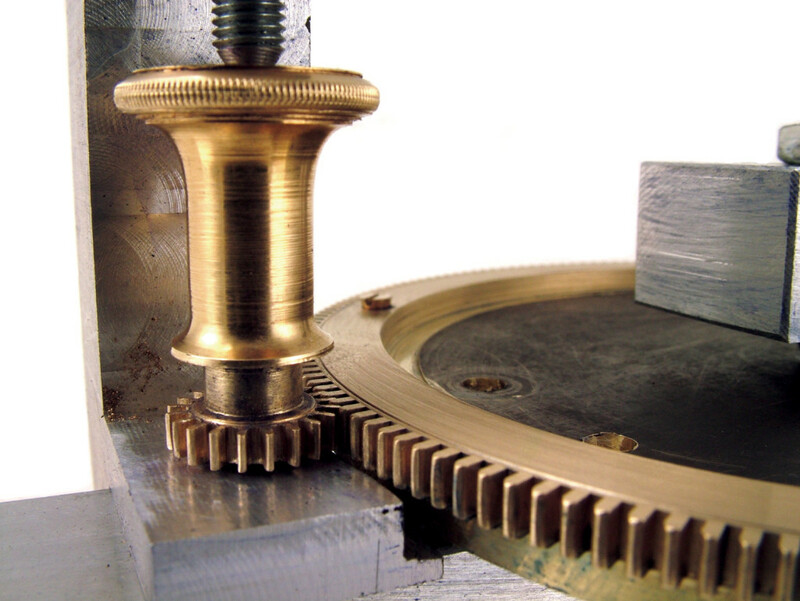 With helpful advice from David Todd, a clock specialist from the Smithsonian’s National Museum of American History, I was able to accurately space and shape the pinion teeth to obtain the proper “mesh” and, therefore, the smooth rotation of the compass body over the horizontal circle. 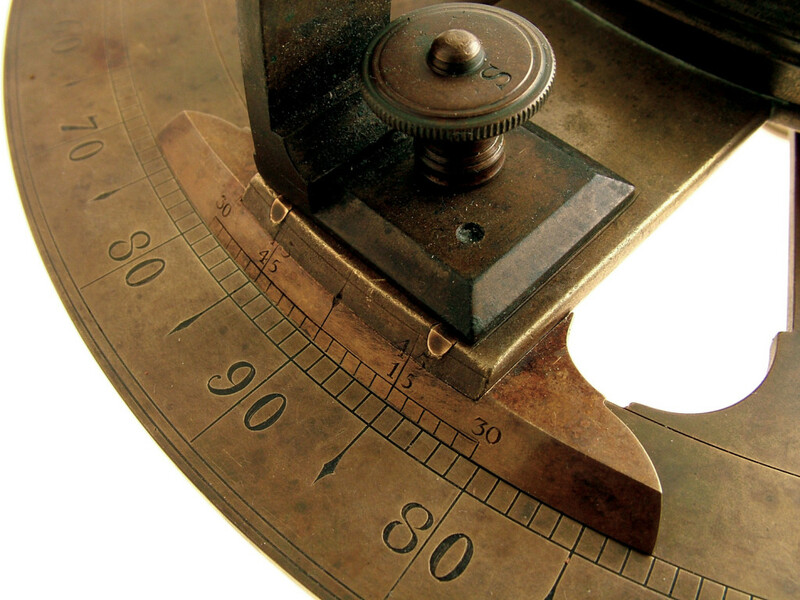 The aspect of fabrication that proved to be the most challenging was the construction of the vernier ends and division of the scales that were to be located at each end of the North/South arms of the compass body. This task of fabrication and division was aided by the fact that there remained portions of the engraved vernier divisions on the original alidade ends. By projecting the 15 – 0 – 45 scale divisions at the ends, the layout of the individual marks was possible. 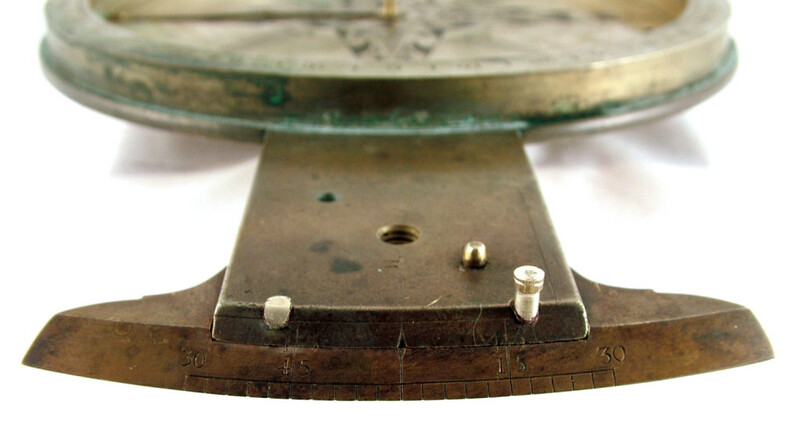 Once completed the new vernier ends were re-pinned to the ends of the original alidade (see Figure 7). This step of the restoration was more complicated than first expected because, under no circumstances, could I allow my restoration work disturb the beautiful, original patina of the compass body. 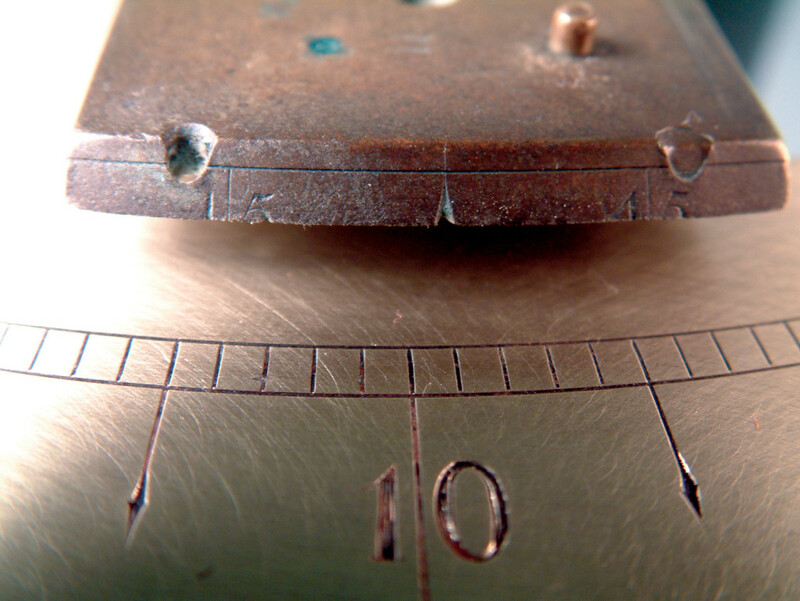 I had to devise a method of drilling the new vernier ends using the original holes in the compass arms, installing pins, and peening them over in preparation for a final filing as close to flush with the original surface as possible, being always careful not to scratch or mar the original surface in any way (see Figure 8 for the final result). All of the replacement pieces that were fabricated, the four sight vanes and vernier ends, as well as the large horizontal circle, were inconspicuously signed and dated for historical documentation. Once all the mechanical fabrication had been completed, as well as the engraving and divisions, the new pieces were patinated to match the original brass as closely as possible (see Figure 9). As the final assembly of the replicated pieces with the original sections began to dovetail together, the amazing intricacy and beauty of this once spectacular instrument began to unfold. Once again we may admire this impressive mechanical and artistic artifact by one of the colony’s finest craftsman and genius of the 18th century, whose name is not well known outside of the scientific community. My only hope is that David Rittenhouse would approve of my restoration. This instrument, along with others from the Colonial period, will soon be on display at the Museum of the American Philosophical Society, Philadelphia, in an exhibition titled: “Undaunted: Five American Explorers, 1760 – 2006.” The exhibition, which will run from July, 2007 to December, 2008, will include selective instruments, paintings and drawings, maps, charts, photographs, and ship models, presenting the explorers in the context of their discoveries and studying the methods of documentation of their important contributions.